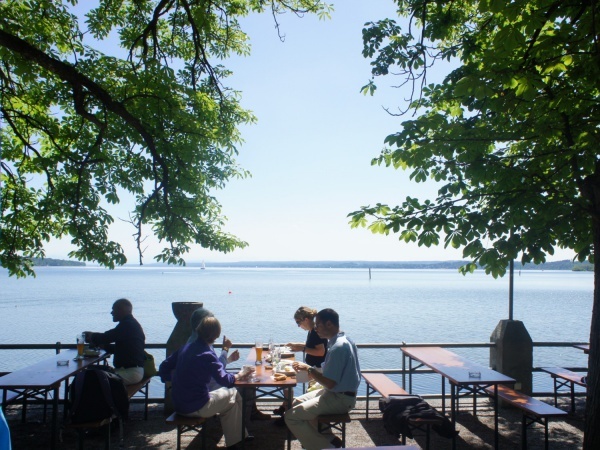 The Seehaus Schreyegg beer garden is located in the small village of Stegen, on the northernmost end of the Ammersee, about 36 kilometres from the centre of Munich. The beer garden is a popular destination for bikers and day trippers, especially during weekends. The beer garden is situated directly at the lakeshore, offering an amazing view onto almost the entire length of the lake, with sailing boats cruising by. On clear days even the alps can be seen across the lake. The self-serviced area offers about 800 seats on traditional beer garden benches. Another 250 seats with regular tables are available on the served terrace. Both areas are shaded by large, dense chestnut trees. The food stall in the self-serviced area offers various typical Bavarian beer garden meals such as Obatzda, Wurstsalat (sliced sausage salad), Fleischpflanzerl (meat balls) and Hendl (roasted chicken). A "friends special" for groups of ten people includes spareribs, baked potatoes with sour cream, coleslaw salad, Brezn and a 20-litre barrel of beer directly at the table (€265, April 2011). The beer served is Hacker-Pschorr and a Maß Hell (lager) costs €6.80 (May 2017 - same beer price since 2012!). Seehaus Schreyegg is also an ideal venue for private parties and other festivities hosted in the excellent restaurant; either in the sea pavillion, the panorama parlour or the idyllic fishermen parlour with a cosy, tiled stove. About 200 metres from the beer garden is a pier, from where guests can depart on round trips on the Ammersee onboard a classic paddle wheeler ship. Small paddle boats are also available for rental. Just next to the beer garden is a public swimming area with a lawn suitable for lazing in the sun. During the beer garden season and depending on the weather, Seehaus Schreyegg is open daily from 10am to 11pm. From November to March the restaurant is closed on Tuesdays.